What is Revolax Sub-Q with Lidocaine? 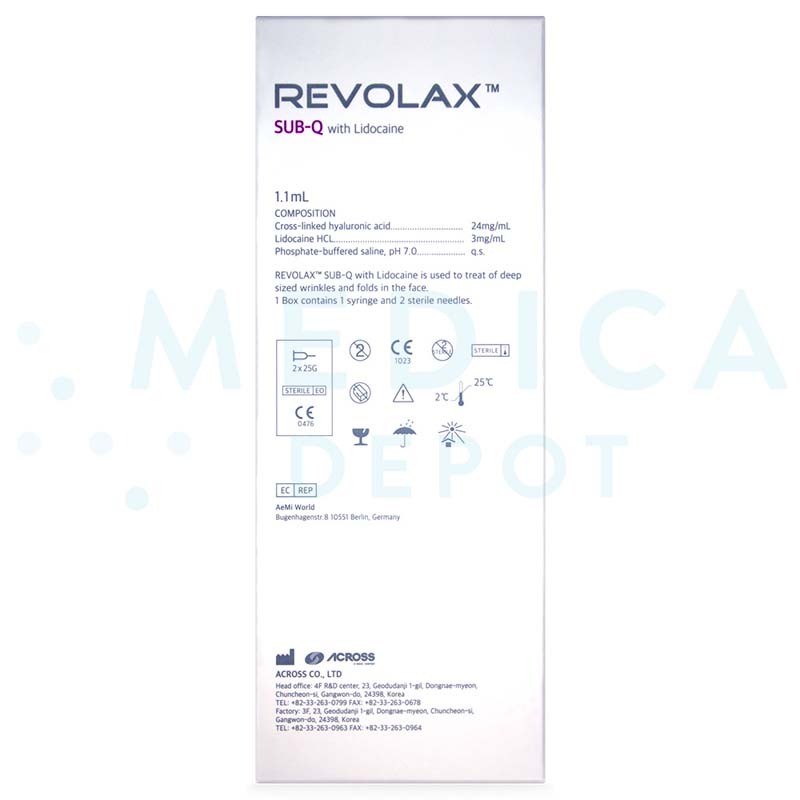 Revolax Sub-Q with Lidocaine is a transparent, tissue-friendly, and completely aesthetic implant that is designed by Across, a South Korean pharmaceutical company that specializes in producing various medical products. This completely synthetic dermal filler is made of 24mg/ml of cross-linked hyaluronic acid gel of bacterial origin. The hyaluronic acid molecules are cross-linked into a monophasic and polydensified gel using 1,4-butanediol diglycidyl ether (BDDE). The filler is also integrated with 0.3% lidocaine to suppress pain caused by the injection process. Due to its advanced ability to mold and maintain its structure for a long time, Revolax Sub-Q with Lidocaine is highly recommended to correct extremely severe and deep-sized creases, such as nasolabial folds and laugh lines, and to non-surgically augment the shape of the nose, chin, and cheeks. This sterilized medical device has a long shelf life of approximately 24 months, which can be achieved and maintained if it stored between 2 to 25℃. You can buy Revolax Sub-Q with Lidocaine and other Revolax fillers from www.MedicaDepot.com. You can register for an online account, so that you get to enjoy various membership benefits, including our referral program, wholesale prices, and free shipping for orders above $250. Order online or call, email, or fax your order today! 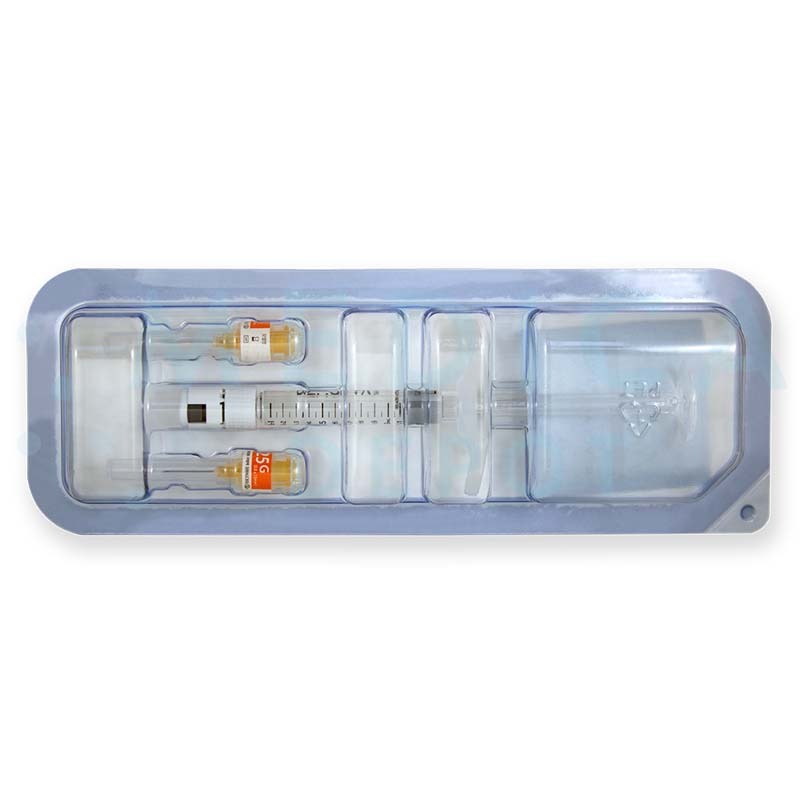 When you purchase a box of Revolax Sub-Q with Lidocaine, you will get 1 prefilled 1.1ml syringe, 2 single-use 25G needles, and a package insert. 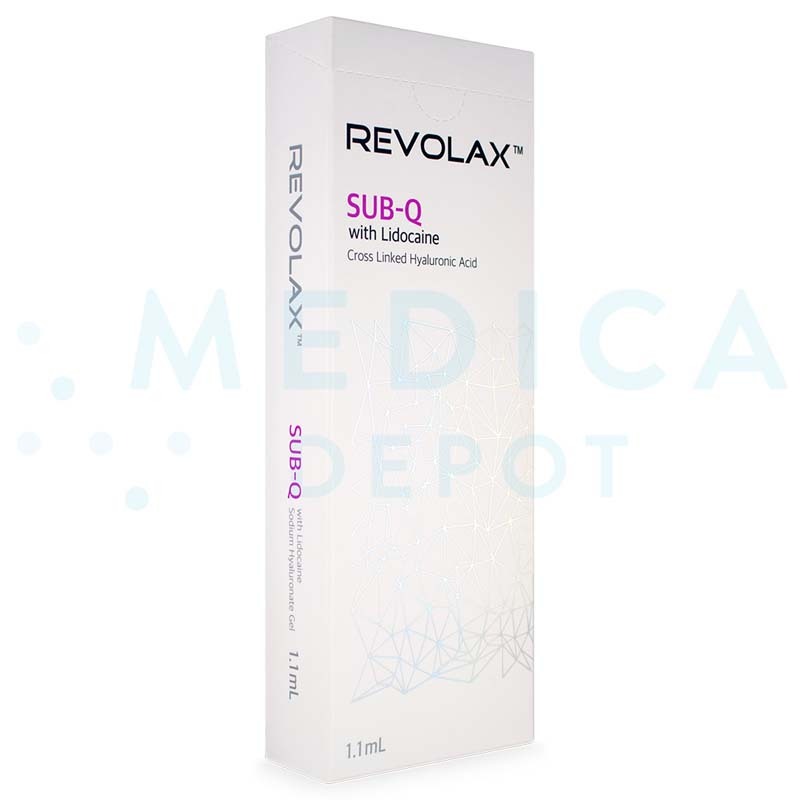 Revolax Sub-Q with Lidocaine is renowned for its premium quality hyaluronic acid molecules. Following extraction from fermenting Streptococcus zooepidemicus bacterial cultures, the hyaluronic acid molecules are deeply purified to ensure that the bacterial endotoxin level is very low at less than 1.2IU/ml. These factors are what enabled this filler to be certified with full European Medical CE accreditation; with this accreditation, the filler can be used safely and confidently in patients. Besides its excellent quality, this dermal implant is also known for its viscoelasticity and longevity due to the resilient monophasic and polydensified texture of the filler gel. With this filler, patients get to enjoy harmonized volumization of the skin for a substantial period of time. 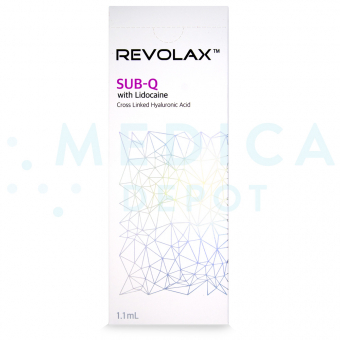 Revolax Sub-Q with Lidocaine works by reinforcing the weakened skin structure. Once injected intradermally, the polydensified gel instantly molds with the dermal framework to volumize skin creases. Its dense and regular patterned gel lattice also allows this implant to be sturdy enough to augment various parts of the face. Revolax Sub-Q with Lidocaine is a completely synthetic aesthetic implant that is made of 24mg/ml of highly pure hyaluronic acid gel and is integrated with 0.3% lidocaine. The hyaluronic acid molecules are extracted via fermentation of Streptococcus zooepidemicus bacterial cultures and are filtered to contain less than 1.2IU/ml of bacterial endotoxins. They are then cross-linked into a viscoelastic and malleable gel via BDDE; however, the final product contains negligible level of BDDE residue. How to inject/administer this product? Commence the treatment session by reviewing your patient’s medical information first to ensure that they are free from contraindicating conditions. Once patients are deemed suitable and they have been informed of the potential side effects, you can then obtain their consent for treatment. For the treatment itself, clean and disinfect the proposed treatment area(s). Next, inject Revolax Sub-Q with Lidocaine into the subcutaneous layer of the problematic skin region(s). Adhere to aseptic medical standards during the injection process to ensure a low risk of infections. You are recommended to administer this volumizing soft tissue implant on patients who have severe and deep skin depressions, such as nasogenian furrows and laugh lines. You can also use this malleable implant on patients who want to augment the shape of their nose, chin, or cheeks without undergoing surgical procedures. Revolax Sub-Q with Lidocaine is specially designed to be injected into the subcutaneous layer of the skin to eliminate extremely severe and deep-sized wrinkles, including laugh lines and nasolabial folds. Since it is a malleable and viscoelastic implant, it can also be used to reshape the nose, chin, and cheek in accordance with patients’ preferences. This filler provides patients with natural-looking dermal improvements that should last for approximately 12 to 18 months. Your patients should return for maintenance filler injections once the results from the initial injection subside. Revolax Sub-Q with Lidocaine is recommended for patients with extremely severe and deep-sized wrinkles, such as the nasolabial folds and laugh lines. Besides that, this malleable and durable implant can also be used to non-surgically augment the nose, cheeks, and chin. You should purchase this premium aesthetic implant because it has scientific research that testifies to its efficacy and safety. The hyaluronic acid molecules used in this filler are of high purity, which means there is very little risk of unwanted immunogenic reactions; this much is apparent though its European Medical CE certification. The dense and regular patterned gel lattice of this filler ensures that it does not migrate. Just like most intradermal filler implantations, patients who undergo treatment with this filler are prone to developing mild localized inflammatory skin reactions, such as redness, bruising, pain, and swelling. These inflammatory injection site reactions should abate once the skin has recovered completely. Read the package insert carefully for information on other more serious reactions and the appropriate remedial methods that your patients should follow.